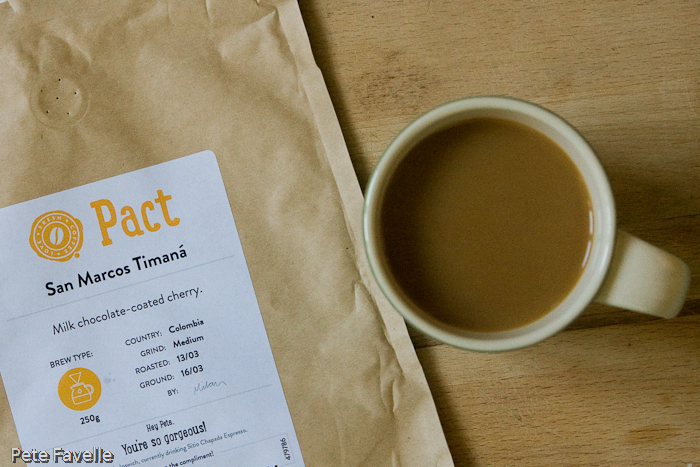 This week’s coffee takes us back to the folk at Pact. After the first offering in my renewed subscription, I’ve got some high expectations – so let’s see if they can continue to impress. San Marcos Timana is from the southwest of Colombia – San Marcos being the region within Timana from which the coffee has come. The grounds have a sweet richness without being darkly roasted; my immediate thought is of a Galaxy Caramel. There is a slight hint of citrus lurking in the background, but that’s mostly covered by the creamy chocolate tones. Brewed, the lime citrus acidity is much more pronounced, along with soft, under-ripe cherries. There’s also a subtle woody note, like freshly cut green wood. In the mouth it’s surprisingly gentle; delicate citrus acidity at the start, slowly joined by a dark, fruity chocolate dimension. It’s not as sweet or as creamy as the aroma suggests, but there’s enough depth of flavour to satisfy. Tasty and refreshing, this is a 3.5 star coffee.